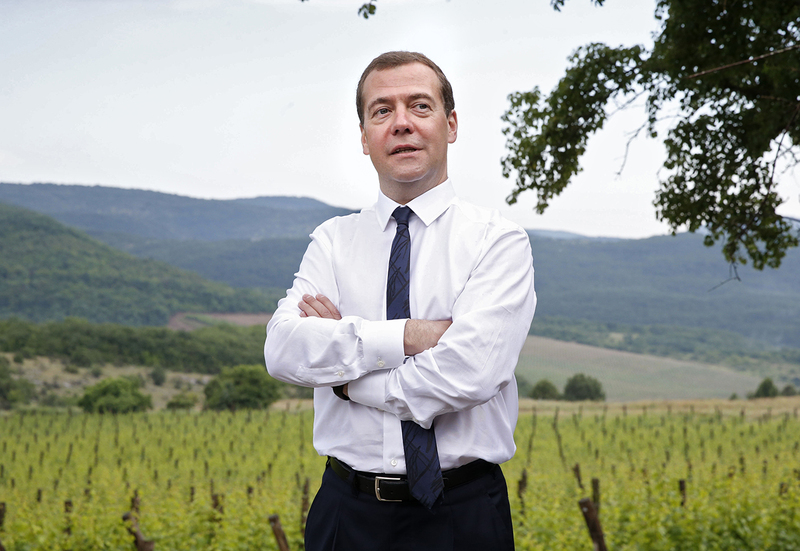 Russian Prime Minister Dmitry Medvedev at Terruar agricultural production cooperative in Rodnoye village near Yalta. The Anti-Corruption Foundation headed by convicted opposition politician Alexei Navalny has published an investigation into a "corrupt empire" allegedly owned by Russian Prime Minister Dmitry Medvedev. These revelations, however, will not result either in civil unrest or in arrests, political analysts are convinced. On March 2, opposition politician Alexei Navalny's Anti-Corruption Foundation (FBK) accused Russian Prime Minister Dmitry Medvedev of secretly owning luxury properties and vineyards in Russia and abroad, yachts and agricultural businesses worth nearly 70 billion rubles (about $1.2 billion), and of unlawfully lobbying for his business interests. The FBK claimed that Medvedev allegedly created "a network of figureheads and dummy corporations" that included his university classmates, his alleged cousin Andrei Medvedev, and a network of charitable foundations. The FBK said that all the assets are registered to the PM’s trustees, but are actually used by Medvedev himself, as follows from his guileless Instagram posts. Medvedev regularly published photographs from the same locations from which his whereabouts could not be definitively determined. Navalny claims that the PM allegedly received money to purchase the luxury properties and other assets that are worth billions as "gifts" from natural resource oligarchs, including Alisher Usmanov, and as loans from one of Russia's largest banks, Gazprombank, whose deputy chairman, Ilya Yeliseyev, went to university with Medvedev. The FBK described him as the PM’s "principal confidant" on whom the whole alleged scheme functions. In less than 24 hours, the nearly hour-long film by the FBK about Dmitry Medvedev garnered 2 million views. It shows mansions, dachas and a castle that were filmed from a quadcopter and that "have never been seen before" because they are surrounded by three-meter high fences. All of the FBK's evidence, as in their previous investigations, came from an analysis of open data, such as statements from the land registry and the registry of legal entities, official sites of organizations, social networks, etc. The FBK's investigation became one of the main social media topics of the day. Many bloggers and journalists called it the "most impressive" and "hard-hitting" of the FBK's materials so far. However, from a legal point of view, nothing in the disclosed materials proves that the real estate and agri-businesses are owned by the PM, said Denis Primakov, a lawyer for Transparency International Russia. The connection can be traced only through the deputy chairman of the board of Gazprombank Yeliseyev, but this is not enough. "From a journalistic point of view, it is evidence, but from a legal point of view, of course not. The FBK has outlined a scheme, i.e. something lying on the surface. It made suppositions but it did not prove them, it did not provide substantial evidence," Primakov said, adding that to start legal proceedings, the data will need to be officially checked for accuracy, formal requests will need to be sent to other jurisdictions since some of the properties are located offshore; in other words, documents submitted through official channels will be required. The PM’s press secretary Natalya Timakova described the investigation as a piece of electioneering [Navalny announced plans to run for president in 2018, however, he will not be able to do it because of his criminal conviction – RBTH], adding that "commenting on propaganda attacks by an opposition character with a criminal record was […] pointless". Kremlin press secretary Dmitry Peskov expressed a similar view, saying that the Kremlin did not study the materials of the investigation in detail, and dismissed it as "creative work by a convicted individual." The State Duma's anti-corruption committee has already stated that it has no intention of reacting to Navalny's investigation. In the first hours following the publication of the FBK investigation, the authorities seemed at a loss, said Ekaterina Schulmann, an associate professor at the Institute of Social Sciences under the Russian Presidential Academy of National Economy and Public Administration, adding that, "it was clear there was no understanding as to how to react to it and what to do." Yet, what one should definitely not expect, as many experts and opinion leaders agree, is that the PM will lose his job. "We do not get dismissals provoked by high-profile scandals, it's just not a possibility. They are considered to be improper and wrong, and undermine the stability of the foundations of the state," Schulmannexplained, adding that Dmitry Medvedev will retain his post until the end of his term. The matter, however, is not only about his post, around which there is a constant struggle. "It is about the whole group of people in power who are associated with him, and if they are under a coordinated attack, some of their positions may suffer," said Schulmann. Investigations such as these are seen not as a civil society activity or some kind of anti-corruption efforts, but as infighting between different groups. The question that everybody is concerned about is not "whether Medvedev is corrupt or not," but who commissioned this investigation, said pundit Konstantin Kalachev. "The interested parties may be not only in the 'towers' [of the Kremlin], but beyond them too... The president will not be taking any disciplinary action, but Medvedev's positions are not boosted by such attacks." As for public opinion, the "corrupt empire" attributed to Medvedev will not pass unnoticed, experts say. True, Russian citizens do not tend to immediately take to the streets, but such accusations "contribute to apathy and disgust, and these can be more dangerous for the authorities than public protests, which the authorities learned how to deal with after 2011-2012," said Shulman, adding that the main problem in the upcoming 2018 presidential would be low voter turnout.